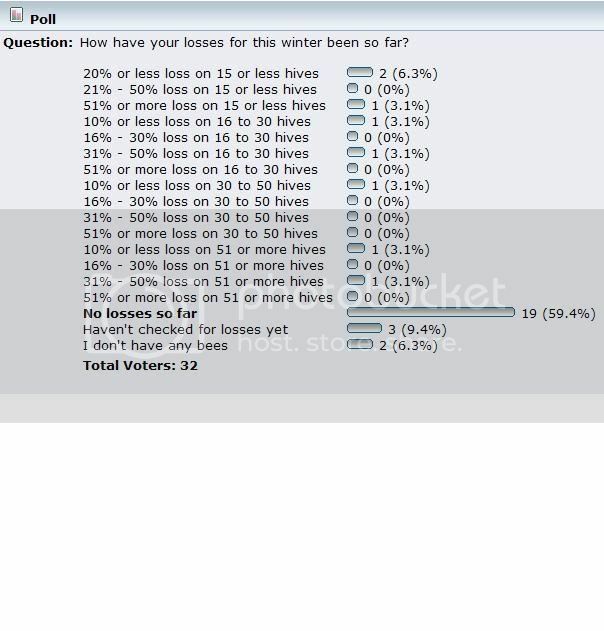 How have your losses for this winter been so far? I've had a few conversations with some others about 2008/9 losses thus far. It would be nice to hear from folks outside my general area, so I decided to include a small poll. I tried to allow a little flexibility in the voting criteria, and also set the poll to allow you to update your vote later if you'd like. You'll have to vote to see the results, but as I said you can change your vote later if your numbers change drastically. If the numbers don't closely meet your situation or you've experienced other problems worth noting either select one of the non-numbered responses or PM me and I'll expand the choices in the poll. If you're seeing other issues (like a more-than-usual number of light colonies, etc.) you can add those in an additional post. It would be nice if we could keep this poll going for a while to get an idea what everyone is experiencing in terms of losses/survival rates. Thanks in advance for your time in helping out with this. Things may change for me, its still 3 months of freezing weather up here, but last check , all going well. With all the posts about people losing hives, I figured I'd take a snapshot of the numbers and then bump the thread to see if everyone could continue to update. Unfortunately, I'm having to change my vote as well. :roll: You can change your vote by clicking "Remove Vote" and then choosing a new vote category. Thank you for participating. Here's a snapsopt below of the old numbers (December). Click at the top of the thread to update the poll. I'm not really sure how to check the hives in winter for a loss. I was thrilled about a month ago when we had a few warmer than normal days and did see activity at all 4 of my hives. But other than seeing the bees, I don't open the hive at all for fear of cold air causing damage. We are in for a very very cold couple of nights, do I just wait (and wait) for a warm sunny day to check? Put your ear up against the side of the box on any day that they aren't flying. They all should be in their own homes on a cold day. Hopefully you're rewarded with the sound of a faint hum/buzz that can be heard through the hive. just knock on the box easy and you should hear them with your ear close, I wonder how many that say they haven't lost a hive has 1 or 2 hives, I have 28 hives and with all the warm weather till now been feeding them, so for I haven't lose a hive this winter but the trying times are still to come because most winter loses are usually starvation and that will happen around February, March, or April ... The worst might be still to come!!! Will post a question in general about that. 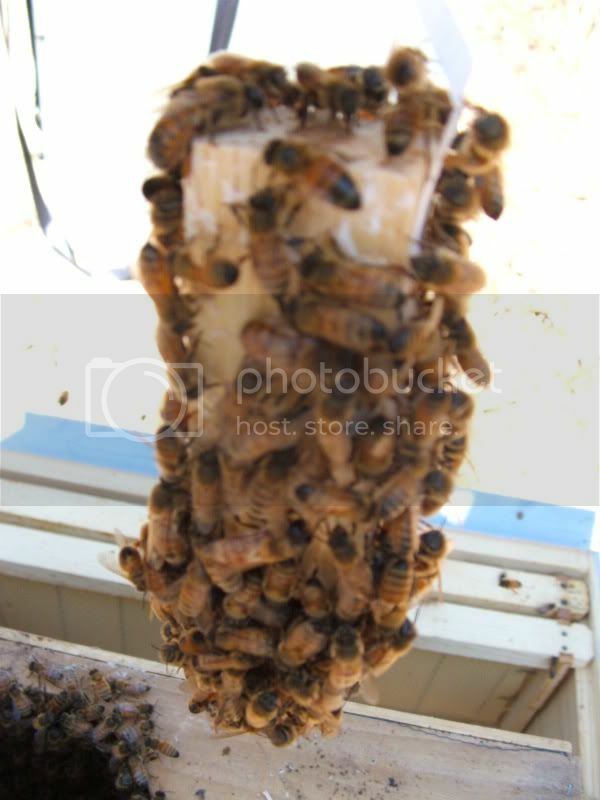 I transfered the small hive into a 2 level heavy Nuc I built and set the frames as suggested. I was hoping to refresh this thread, get folks to update their numbers, and also have folks describe the problems they've encountered this winter or that they're running into with things starting to pick for spring. If you had the foresight to know that this winter was going to be such that it was, let us know what you did in addition to your regular regimen to help out. Thanks in advance for your time. And even more beautiful is knowing that you are the reason behind it!!! Checked today and out of my two hives, I lost one. Other one showed strong bee activity. I swear it was SHB that got that one hive (this year I will be after them with renewed vengeance), but it's all ants now.